Micron shares are dropping after the chipmaker gave weaker-than-expected fiscal first-quarter guidance due to PC processor shortages. Analysts are concerned the negative impact from Intel's processor manufacturing issues may last longer than one quarter. Micron confirmed investors' worst fears, saying PC processor shortages are hurting demand for its memory chips. The chipmaker's shares were down 2.9 percent Friday, a day after the company gave weaker-than-expected fiscal first-quarter guidance. Micron estimates the company will generate November quarter sales of $7.9 billion to $8.3 billion versus the Wall Street consensus of $8.45 billion. J.P. Morgan said last week that Intel's chip shortage is 'worsening' and will hurt fourth-quarter PC sales by up to 7 percent. The firm said Intel is having capacity issues from its delays moving to next-generation 10 nanometer manufacturing technology. Micron said on its earnings call Thursday it is "possible" the negative impact from processor shortages could go beyond its November quarter. Nomura Instinet slashed its price target for Micron shares by 35 percent to $65 from $100 due to concerns about the memory chip cycle. "We believe guidance (near- and medium-term) is likely to be perceived as optimistic in light of the current environment where competitors are seemingly planning for a protracted downturn," analyst Romit Shah said in a note to clients Friday. "We expect Micron shares to remain volatile until we see the rate of price declines moderate." Shah reiterated his buy rating for Micron shares, citing the company's stock buyback program and its attractive valuation. 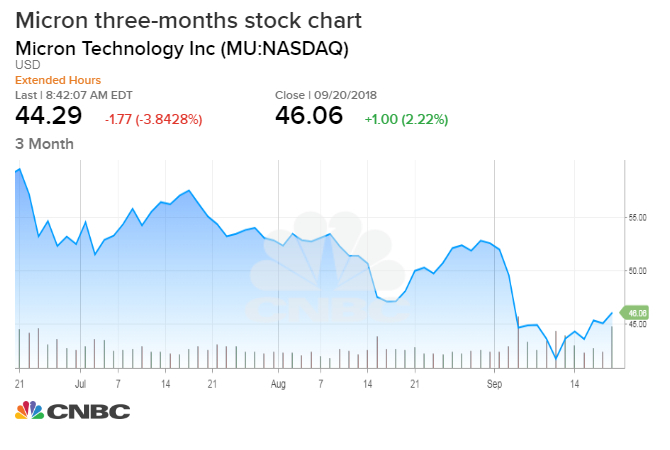 Morgan Stanley reiterated its equal weight rating for Micron shares, saying the Intel's processor shortage may become a bigger issue for the chipmaker. "This is how memory downturns begin. ... We're frankly still digging into the magnitude of the Intel shortfall impact," analyst Joseph Moore said in a note to clients Friday. "In our last round of supply chain checks the Intel shortage was an irritant but did not seem to be disrupting builds that much — more of a limitation that kept companies from building upside to forecasts. But that may be changing for 4q and beyond." Moore lowered his price target to $48 from $65 for Micron shares, representing 4 percent upside to Thursday's close. The company's stock have already been under pressure this month due to heightened concerns about slowing memory chip demand. Micron shares declined 12 percent month to date through Thursday. Earlier this month, Morgan Stanley and an executive at KLA-Tencor said the memory chip market is deteriorating versus expectations, which drove a big drop in the semiconductor sector's shares.